History: Asked to sum up his career in a word or two, Sheldon Steiger describes himself as a "music producer" or "recording engineer." Offered the chance to elaborate, he says he helps musical artists "record and perform their music." He adds: "I help them define what they want to sound like, and then I work with them to achieve that sound in the recording studio -- or in a live performance." Those definitions may suit a questionnaire or a casual conversation with a stranger, but they hardly do justice to Steiger, a multitalented music maker with a singular gift for helping artists realize their creative ambitions. The list of Steiger's accomplishments is stunningly diverse. He is a musician, composer, arranger, producer, engineer, mixer, sound designer, and DVD producer who has worked with some of the biggest names in pop music. Steiger, who is based in New York, toured with Paul Simon as a keyboard and drum tech, and with P.M. Dawn as a programmer. He worked extensively with Joe Jackson on the Night And Day 2001 concert video, the live album Summer in the City, and the Grammy-winning Symphony No. 1. 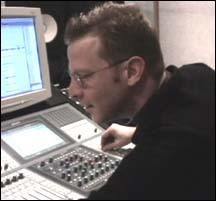 As a Pro Tools engineer, Steiger worked on full-length projects by the Verve Pipe and Bon Jovi. Steiger also engineered tracks for the Baha Men, Ricky Martin, and other rock and pop stars. He produced a pioneering DVD for Run-DMC. He composed original music for the film American Psycho. Stories of serendipitous transitions from technical to creative roles abound in Steiger's résumé. As if to prove the axiom that people make their own luck, he has demonstrated an uncanny ability to be in the right place at the right time. Pop is only one of many cards in Steiger's deck. He is a classically trained musician who earned degrees in piano performance and recording arts from the prestigious Peabody Conservatory. His credits as a producer, engineer, and musician encompass a wide range of styles, from rock, pop, and hip-hop to world music, Latin music, and contemporary classical. "I love music more than anything in the world," says Steiger. "I just happen to have a broad definition of what music is." Current credits: Recently, Steiger served as associate producer, engineer, and mixer on the debut album by the Beu Sisters, a vocal quartet from Florida that's bound for stardom. "The Beu Sisters project is a good example of what can happen in the studio," says Steiger. "I got hired as an engineer to run the Pro Tools rig, but Steve Greenberg and Mike Mangini - the album's producers - recognized me as a guy who can do more than push buttons. So I ended up being a session keyboardist, vocal arranger, mixer, and associate producer." These days, Steiger keeps a studio at S-Curve Records, where he has focused on pop projects by the likes of the Beu Sisters, the Baha Men, and a developing artist named Joss Stone, whom he describes as "dizzyingly talented."